Jagged Alliance? Really? Looks nothing about what I remember it... maybe I fell into a deep hole and forgot how games looked like? Guess I didn't pay that much attention to the briefings then. I guess, not that many Australian adventurers around here. Maybe it's time for some tell tale hints. Oh, I didn't realise this would be so obscure. Okay. Umm... the name starts with an E. It's a one word name with eight letters. It was re-released in a deluxe CD edition in 1997. I don't know how much more I can give away, but I'll keep dropping hints. No idea. Guess based completely on your crosword style hints - Explorer? Unfortunately, that's not it. But here's another clue to narrow it down further. It was published by WizardWorks Software. Entombed? My favourite game of all time! Really? THE Entombed? OMG! Can't believe you've picked Entombed! Jesus! I mean, life can be sooooo strange, man! Wow! To find Entombed here...it's just...Wow! Heh heh. Alright, I'll quit hogging the spotlight. Your turn Miguel! 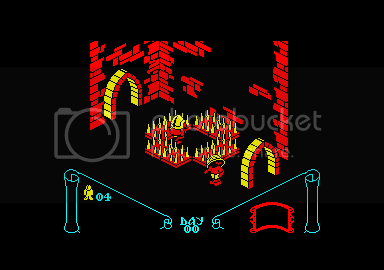 This one's even easier, but now that you've posted from one classic isometric Speccy game, I can't stop myself from doing another! One from EVERYBODY'S Top Ten Speccy Games list. Yes indeed! One of the greatest games of its time, Jon Ritman and Bernie Drummond pushing the 8-bits to their limits and beyond. I'm gonna go jump off a bridge now. Nice one! Actually the version I posted from Knight Lore was the Amstrad version. But yes, you're right, it's amazing that Head Over Heels was made on the ZX machine.